I keep reading stories about how the SNP are trying to block Brexit. Sometimes they seem determined to stop the whole of the UK leaving the EU. At other times they apparently want Scotland to both remain in the UK and in the EU. There have been all sorts of odd schemes proposed. Some Scottish nationalists find a precedent in the fact that Greenland decided to leave the EU in 1982, but remains a part of the Kingdom of Denmark. Couldn’t the reverse happen to Scotland? Nicola Sturgeon has come up with five tests that somehow must be fulfilled for her to continue to be content with Scotland being a part of the UK. These amount to Scotland being a full member of the EU and could not be fulfilled in any other way. Sometimes these demands are accompanied with threats of if you don’t do what we want, we’ll hold another independence referendum. Apparently there may be secret plans to hold one next year. Alternatively there are no secret plans whatsoever. It’s all very thrilling and cloak and dagger. Of course, some red meat must be flung to the fanatics from time to time, but the reality is that far from being desperate for independence at the moment the SNP is desperate somehow to stay in the UK. Why have conditions at all if the SNP really wants independence? Why not simply say we want to leave the UK and stay in the EU. Why try to block the UK from leaving if you don’t want to be part of the UK? The SNP have quite a large number of seats in the UK Parliament. Apparently they think they can use these seats to somehow veto Brexit. But why should they want to? If leaving the EU is so intolerable that Scotland will rise up and demand another independence referendum, why is the SNP trying to prevent it? Don’t they want independence? It is becoming ever clearer that the SNP is getting itself into a muddle. Why visit a junior minister in Berlin? He can't give you independence. The key point to grasp is that while the SNP is full of people who are desperate for independence, Scotland isn’t. There are people like me who are against Scottish independence under all circumstances. There are people who would support Scottish independence if they thought it would make them better off. Finally there are independence supporters who want independence come what may. But these people are not enough to win. After the EU referendum quite a lot of Remain voters briefly flirted with support for independence. I’ve come across people who I considered to be solidly Pro UK who suddenly wrote things that suggested a certain sympathy with the SNP. But people do say silly things in the heat of the moment. These disappointed Remainers are at the very least not SNP fundamentalists. They will look at the argument for Scottish independence and weigh up the advantages and the disadvantages. The problem for the SNP, as I keep arguing, is that it is much harder to make the case for Scottish independence in the context of Brexit. The SNP leadership are going to have to throw out pretty much the whole of their independence White Paper of 2013. Brexit has sent them homeward to think again. But until and unless the SNP can come up with a credible alternative that looks reasonably attractive, they cannot expect to actually win another independence referendum. They need to answer the difficult questions now because they can’t win independence without a political campaign. During that campaign Scottish minds would be concentrated and politicians and journalists would keep asking the hard questions. The SNP wouldn’t be able to get away with blind optimism and everything would be alright, because while this would satisfy their supporters it won’t satisfy the majority of Scots. It’s crucial to realise that SNP threats about a second independence referendum are empty for the moment. The first nationalist condition for the possibility of indyref two is that Nicola Sturgeon thinks she can win it. But there’s another condition I believe. If somehow she could persuade a majority in Scotland to vote for independence, but that this led to a significant deterioration in Scottish living standards Nicola Sturgeon knows that she would be blamed. What’s more I don’t think she is the sort of person that would like to see ordinary Scots made worse off. So while she certainly wants independence one day, it’s not at all clear that she wants it right now. What do the SNP want? They want to make gradual steps towards the goal of independence. This is the crucial point that UK politicians have failed to grasp over the years. Foolishly in the last days of the independence referendum UK politicians made a promise that the Scottish Parliament would gain new powers. I think they should have made it clear that fulfilling this promise was conditional on everyone in Scotland accepting the result. There are two sides to every bargain and the SNP has simply not kept its side. What concessions have they made to the fact that the majority rejected independence? So we had the Smith Commission which gave lots of new powers to the Scottish Parliament. The SNP wanted more and when they didn’t get all they wanted they claimed that the UK Government hadn’t kept its promise. Under those circumstances it would have been better simply not to have kept the promise. Granting all those extra powers hasn’t helped the Pro UK side of the argument one little bit. The SNP wants independence just as much as they always did. Every new power they gain is a step along the road to independence. UK politicians have to realise that they are feeding whiskies to an alcoholic. It is unlikely that doing this will make him sober. Don’t make concessions to Scottish nationalism. It hurts our side of the argument by gradually making Scotland seem more and more separate. The SNP want to take baby steps towards their goal and then fall over the finish line. Don’t help them to do this. On the contrary, what the UK needs is more things that bring us together, more things that we share. We need less division not more. It is for this reason that the response of pro UK politicians and journalists has been so disappointing since the EU referendum. Some people began writing about federalism as a way of keeping Scotland happy. Others began writing about giving Scotland a special status so that it can retain aspects of EU membership. Some Pro UK MPs even think it is a good idea for Scotland to have its own national news programme at six. Each of these things is just one more gradual step along the way to independence. There is only one lesson from the past twenty years of Scottish politics. Making concessions to Scottish nationalism gradually strengthens it while weakening the UK. Cease making concessions. Instead reassert the unity of the United Kingdom. Make it clear that our country is not splitting. Not now, not ever. The SNP is a spoiled child that uses the threat of independence to gain concessions. It is happy for the UK to continue to subsidise Scotland. But it always bites the hand that feeds it. It is absolutely crucial that UK politicians begin to understand the SNP mentality and the SNP tactics. No matter what you give to them they are not going to be content. All you do is demonstrate your weakness. So give them nothing. Of course, be friendly and diplomatic. There is no harm in consulting and listening. But never treat Nicola Sturgeon as if she is the leader of an independent sovereign nation state. She isn’t. Always remind her that she lost the only vote that mattered. Brexit is going to happen or else we don’t live in a democracy. But it cannot happen unless the whole of the UK leaves and under the same terms. How could Scotland retain free movement of people while the rest of the UK did not? What would stop those people simply crossing the border into England? How could the UK as whole come up with a trade deal with, for example, Australia if Scotland was governed by EU rules? Would that trade deal only apply to England, Wales and Northern Ireland? On the other hand what if new EU regulations applied in Scotland, but not in the other parts of the UK? This is a recipe for confusion and chaos. If Scotland somehow stayed in the EU while the UK left it would make Brexit far less beneficial for the other parts of the UK. Instead of the UK Parliament being free to make our own rules we would always have to think of whether it would be commensurate with Scotland being in the EU. We would be constrained, for example, with what we could do with regard to UK VAT because Scotland would still be in the EU and subject to EU rules on VAT. This would apply to any number of issues. Most importantly we couldn’t make the UK Parliament fully sovereign because the law in Scotland would still be subordinate to EU law. There is an interesting debate to be had in the UK at the moment about the type of Brexit we should have. Some people have argued that we should simply leave the EU abolish all tariffs and say to the EU we are open to trade. If they chose to punish us they would in fact harm themselves. On the other side of the argument there are those who argue for a soft Brexit. Some favour a Norway model, some favour a Swiss model. Between a hard Brexit and a soft Brexit there are endless permutations. Let us hear the arguments. Let us weigh up the advantages and disadvantages. I tend towards supporting simply leaving, as I don’t want the EU to have any influence at all on our lives in the UK. But I also recognise that this may involve some challenges. There are people I respect who support a soft Brexit. I’m open to persuasion on this. Let’s have the debate. The various parts of the UK have a role in this debate. But no one has a veto. What’s more someone representing 5 million people in Scotland should have no more influence over the outcome of the debate than someone representing 5 million people in Yorkshire. We are all equally British citizens. I ought not to have more influence because I am Scottish than if I am someone from the Isle of Wight. It is vital that no one should even consider making the sort of concessions that Nicola Sturgeon wants. They amount in effect to independence through the back door. If Scotland were in the EU while the other parts of the UK were not, then Scotland de facto would have achieved independence. Scotland's being in the EU while the UK is not is simply incompatible with Scotland being in the UK. Greenland may not be fully independent, but it is as near to independence as it’s possible to get while remaining part of the Kingdom of Denmark. The SNP has become too used to having its own way. It's time someone firmly said No and pointed out clearly that Scotland is not an independent sovereign nation state, but rather a part of one. Nicola Sturgeon disgracefully had a meeting with the UK Prime Minister without there being a Union flag on display. She would not have done that if the leader she met had been from China. Why then does she disrespect the leader of the country which includes Scotland? It is time that everyone realises that Sturgeon's threats are empty. She is all over the place at the moment trying to stay both in the UK and the EU. This is a position that is obviously self-contradictory. Why hold such a position if she thought she could win an independence referendum? Look beyond the bluster and the necessity of keeping the SNP fanatics onside and it becomes ever clearer that Sturgeon doesn't even have an argument. No further concessions need be made. Indeed they are the equivalent to giving in to a toddler in the supermarket. I want. I want. I want. It’s time to stop spoiling the SNP or the tantrums will only get worse. I agree and would go further to say that notice should be served that powers granted to Holyrood, if not used within three years would revert to Westminster. This constant demand for more 'levers of power' that then remain unused by the Scottish government mu be curtailed. We should have learned from 1938 that appeasing nationalists does not work, their innate sense of entitlement drives them constantly demand more. It's actually very simple. Grant Scotland full devomax and you probably would find that the vast majority of the population would be happy and would then stick with the UK. Doing otherwise will continue to lead to independence demands and rightly so. What makes Scotland so special that she alone should get everything she demands? England - the largest and most populous nation of the UK - doesn't even have her own parliament, yet is consistently ignored when constitutional matters are discussed. If Scotland gets devo-max, then so should Wales, N Ireland and England. Any other solution would prove untenable in the long run. Couldn't agree with you more. I would institute multiple parliaments for the various english regions. That way they can try and improve life for the locals who live there. London and the South East get far too much. For example fornevery one pound spend on infrastructure in the North the South East gets twentyfour. This is one reason why life is tougher outside London. Is Scotland somehow banned from getting what it wants ? Surely if all countries in UK were run as a federal state with only defence and potentially foreign affairs being done collectively this would end all thses demands. As has been stated elsewhere people are only asking for what was promised before, the handwringing now and failure to deliver just elongates the agony. I'd rather see an English Parliament within the UK or better yet an independent England altogether. Scotland has had promises given to her, so has Wales, yet England has had nothing apart from some awkward fudge involving "city regions" and "English Votes for English Laws". England - the largest nation of the UK - has been treated with nothing but contempt by the UK media and political establishment. Not arguing with that at all, it still does not justify Scotland not getting what it was promised. Its the political parties you vote for who are letting you down. You did get EVEL and were offered regional government but people rejected it. But England hasn't been offered a parliament of her own. An English parliament would be the best way to try and secure the UK's future. Believe you me I would love nothing more than for Scotland to become independent. However, the issue at hand here and now is the fact Scotland has a devolution settlement, may be on course for further autonomy in due course, and may even get another referendum before the end of the decade. England however gets nothing more than a fudged EVEL and a lop-sided deal involving city-regions. No national parliament, no political recognition, nothing. Please provide references to these stories so they can be corroborated. It has been mooted that the Scottish Government could have a veto since much EU law is enshrined in Scottish law and there would need to be an agreement to untangle it. However, UK law may be said to have supremacy in which case the point is indeed moot. No-one knows how many UK or Scottish (or Welsh or Northern Irish) laws are effected or how much time and effort it will take to undertake the review and revision – you may want to speculate on the competence of those who initiated this state of affairs. Whereas, the other side has kept theirs (irony alert) and, again, please provide some reference to the bargain supposedly not kept. This is undoubtedly true. However, there is the counter argument, that continuing within the UK outside the EU will, as can be demonstrated because it is happening, lead to a deterioration of the countries’ economic stability (possessive plural deliberate). This may be a myth. There are discussions going on elsewhere about the validity of GERS but, just as a thought, in a capitalist system, such as the one we live in, if there is a branch making a loss, then that branch is closed or sold off but this isn’t happening, indeed the opposite, there is a wailing and gnashing trying to hold onto the allegedly loss making branch possibly leading one to suspect the figures are at fault – there is no loss, there is no subsidy. That would be the Former UK’s problem not Scotland’s. 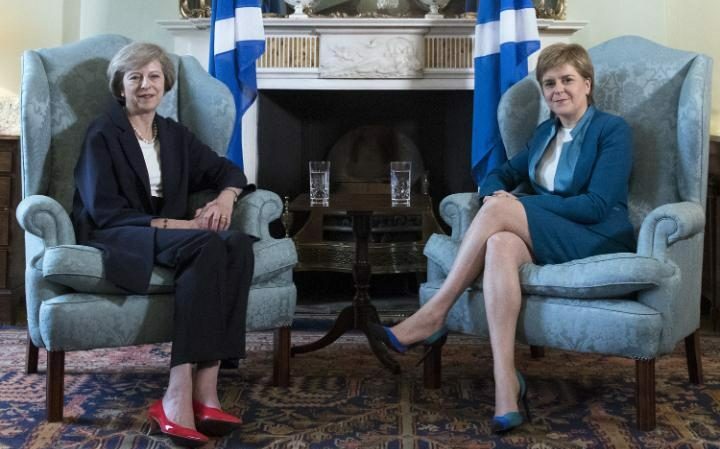 Flags – “She would not have done that if the leader she met had been from China.” And, above, there is a picture of the First Minister with the Saltire. Despite the rhetoric, I suspect a tentative acknowledgment of the step-by-step approach, waiting while possibly alternatives are investigated and, where appropriate, dismissed, leading to the possible / probable / inevitable. If an appropriate alternative strategy presents itself, federalism perhaps, which had majority support in Scotland, then the Scottish Government would have to accept that. Perhaps acknowledging that the status quo is not viable and promulgating sensible alternatives would be a useful way of expending energies. I have read a few of your posts. Only a few as I have only recently found your blog. I must admit that I have found myself agreeing with a lot of your work, but I come to a completely different conclusion to you. I surmise that this difference is simply your unwillingness to embrace an independent state. With the above you are at pains to not allow any new powers because your scared of the possibility that it will lead to indy. I disagree, new powers need to be granted commensurate with the promises of the Vow. Failure to do so demonstrates that the UK is disingenuous, and nobody wants that in their politicians. If the Vow was fully delivered you would probably find the desire for indy would reduce. So I disagree with the entire premise of your above post. As bedelsten has shown there are a number of holes in your article.